Here is the second installment in my series on DIY baby clothing! As promised, today's project is easier than the first one. :) If you missed it, here is the first post on making baby overalls from old jeans. Today I'm going to show you how to turn an old shirt into adjustable baby pants. These pants adjust in the length and at the waist, so your little one can wear them for longer! I absolutely love these pants! They are really cute and super comfy! In fact, I'm making them in several different colors because they are so easy to make and they go with everything! I found a few tutorials out there for making leggings from knee-high socks or shirt sleeves. I tested a few of them and decided they weren't for me. Most of the "leggings" made from socks are actually nothing more than leg-warmers, which wasn't what I wanted. The leggings made from shirt sleeves sounded like a fun, easy project, but I wasn't thrilled with the fit of the final results. They were okay, but the curve of the crotch seam was all wrong, and when I tried to correct it, I ended up with pants that were too small in the waist, because there was not enough material in my sleeves. I don't know about you, but I don't want to spend my time on a project only to get so-so results and some leggings that scream "homemade". If you are not familiar with using a twin needle, there is an excellent tutorial at Make It Love It. The only tip I would add is that, when working with knit fabrics, I find it helpful to stretch the fabric slightly as I sew. Note: In choosing the pants to use as a pattern, use the size you want the pants to adjust to at their largest point. For example, my daughter wears 6 month clothes right now, so I used a pair of 9 month pants to make the pattern, making the pants adjust between size 6 month and 9 month. I wouldn't recommend trying to make the pants adjust more than one size. Fold your pattern pants in half with the back on the outside and lay it on your shirt. Fold your pattern pants in half with the front on the outside. Cut out from the shirt, leaving the same amount of seam allowance you used for the back. Cut out 6 rectangles about 2" wide by 6" long. If you plan to make more than one pair, I recommend cutting them all out at once. However, if you're not sure about your fit, making a trial pair first may be a good idea. :) I cut out more than one pair, and for some reason switched from taking pictures of the red ones to the gray ones at this point. Matching right sides together, sew the front leg to the back leg at the side seam. You'll notice I used a serger; I love a serger for sewing on knits. However, knits don't ravel, and sewing with a conventional sewing machine is just fine. Starting at the crotch, sew the inner leg seam on both legs. Now this next part sounds a little confusing, but it is going to give you a nice crotch seam. Turn one leg right side out, but leave the second one inside out. Put the right-side out leg inside the other leg, matching up the seams. Line up and pin the crotch seam, and then sew it. Pull the one pant leg out from the other one and you can see your little pair of pants taking shape. Serge or edge finish the top edge and hem edges of the pants. This step isn't strictly necessary, but helps yield a professional result. Fold over 3/4" at the waist edge and stitch down to form the elastic casing. Leave a couple inches open to insert the elastic. I like to leave this opening at the back because it looks nicer and it helps me know which side of the pants is the back--homemade clothes don't have tags, after all. Measure the waist on your pattern pants and cut a piece of elastic that length plus an extra inch. Using a safety pin, feed the elastic through the casing. Overlap the elastic ends 1", being careful not to twist the elastic, and stitch the elastic together. I go over it several times to make sure it's nice and secure. Stitch the opening in the casing closed. Fold up 3/4" on each hem and pin in place. Sew each hem. You now have a completed pair of pants! If you want, you can stop here. To make them adjustable, keep reading. With right sides together, fold one of the little rectangles in half lengthwise and sew. Turn right side out. Thankfully, this is much easier with knit fabric than with other types of fabric! Repeat with the remaining rectangle pieces. Tuck in the ends of the rectangles and stitch around entire outside edge. I tucked in a little more on two of the rectangles to make my waist tabs just a little shorter than the leg tabs, but that's just a matter of personal preference. Put a buttonhole in one end of each tab. My machine has a special buttonhole designed specifically for knit or stretchy fabrics. If your machine does not have this feature, any buttonhole will work. Take one of the tabs and fold it in half to find the center. Line up the center of the tab with the side seam of the pants at the waist. Pin in place, with the buttonhole going toward the front of the pants. Sew the back of the tab in place. I sewed it in a little square with an X in the middle. The rest of the tab should hang free. Repeat on the other side with the second waist tab. Sew 4 buttons to the front. The first set of buttons will be sewn right where the tab reaches naturally; this is the set you will use when your child has grown a little bigger. This set of buttons does not actually affect the fit of the pants, it is just there to hold the tab down flat when the pants are adjusted to their largest size. The second set of buttons will be sewn an inch or so closer to the center front, so that when the tabs are secured to these buttons, the pants are cinched up a littler tighter, fitting a smaller child. Your pants now have an adjustable waist! To make the pant legs adjustable, you are going to sew a tab and button to each leg seam--one on each inner leg seam and outer leg seam. Slide the tab inside the pant leg until it is just far enough inside that it doesn't peek out the bottom. Pin the top of the tab in place on the seam. The button will go at the same spot on the outside of the pants. In fact, I sewed on the button and tab together at the same time. Just like the waist tabs, the leg tabs are only sewn at one end. The button is at the same end, secured on the outside of the pants. Instead of sewing the leg tabs on by machine, I sewed them by hand, catching the button at the same time. To use the leg tabs, fold a cuff in the pants and then fold the tabs over the cuff to button in place. Sew on all four leg tabs and buttons, and you are finished! Put those pants on your little lovebug and be proud of yourself for making a thrifty pair of pants that can grow with your child! 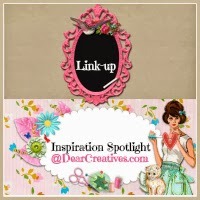 Linking up with Dear Creatives!